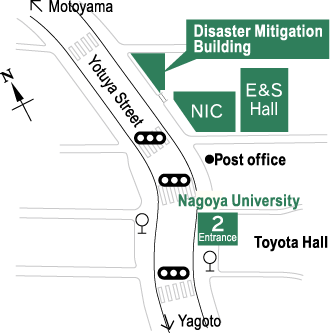 The Disaster Mitigation Research Center (DMRC), Nagoya University, was founded in December2010. Nagoya City and the surrounding Chukyo area are vulnerable to natural hazard risks, particularly colossal earthquakes along the Nankai Trough plate boundary. The Japanese government estimates that there is a 70-80% chance of a massive earthquake occurring during the next 30 years. The area also has a history of damaging floods and storms. Since this area is the center of industrial production in Japan, the natural hazard risks have the potential to cause a serious crisis at the national level. The DMRC brings together experts from various academic fields, such as engineering, earth science, social science, and humanities as a means of promoting cooperative multidisciplinary research aimed at developing and applying a state-of-the art disaster mitigation model to ensure that the local community is safe and secure. The DMRC provides a cooperative framework for local government, companies, and citizens to improve the preparedness of the local community for future natural hazards. In addition, the DMRC offers disaster mitigation training courses for local public officers and volunteers. The Disaster Mitigation Research Building (Gensai-kan) where the DMRC is located has an exhibition hall and a library, which offer the public information about natural disasters and their mitigation. Please also refer to the following pamphlets *You need to use Adobe Acrobat Reader to view or download the documents in pdf format. copyright (c) Disaster Mitigation Research Center all rights reserverd.